Handle more orders with faster response times, today and tomorrow with Dell EMC™ VxRail™ P470F. Databases are often the driving force behind a company’s mission-critical work. Databases power online stores, confidential records, and customer management systems. As your company grows, it is important to have a solution that can sustain high levels of database work. 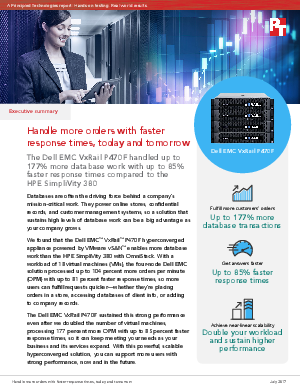 This white paper provides 3rd party hands-on tested and validated facts on how Dell EMC™ VxRail™ P470F powered by Intel® Xeon® processors is superior to HPE SimpliVity 380 with OmniStack for virtualization.